Working outside the International Space Station, NASA astronaut Reid Wiseman and European Space Agency crewmate Alexander Gerst successfully moved a failed ammonia pump module to an external stowage platform Tuesday, completing a task originally planned for a repair spacewalk last December. They also replaced a burned-out television camera light, used during spacecraft arrivals and departures, and installed a backup payload power system on the mobile transporter used to move the station's robot arm and attached equipment from one worksite to another. The spacewalk, the 182nd since station construction began in 1998, got underway at 8:30 a.m. EDT (GMT-4) and ended six hours and 13 minutes later when Gerst and Wiseman returned to the Quest airlock and began repressurization procedures at 2:43 p.m. It was the fifth of seven spacewalks planned this year by station astronauts and the first for Wiseman and Gerst. "Alex, it looks like we've almost got a full moon out here," Wiseman marvled as he floated out of the airlock. "It's beautiful." A few minutes later, Gerst said simply "this is awesome." "Yep, this is amazing," Wiseman agreed. The major goal of U.S. EVA-27 was to move a failed ammonia coolant pump from the mobile transporter to an insulated bay on External Stowage Platform No. 2 near the airlock. 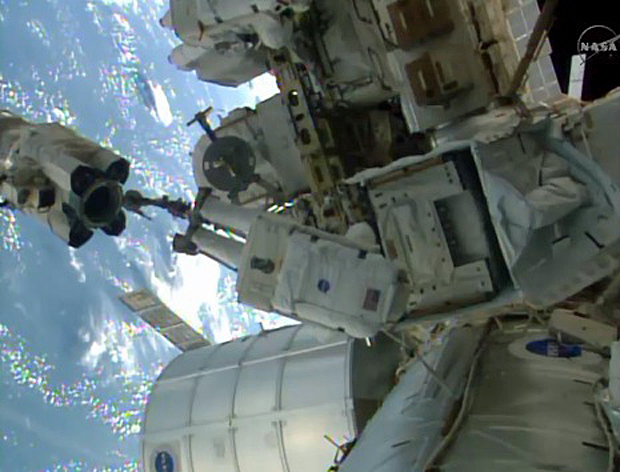 The pump failed last December and was replaced during two spacewalks later that month. But the repair crew did not have time to move the failed unit back to ESP-2. Gerst, anchored to the end of the station's Canadian-built robot arm, manually carried the boxy pump module from the forward face of the lab's solar power truss to the storage platform. Barry "Butch" Wilmore, operating the arm from inside the station, maneuvered Gerst into position so he and Wiseman could slide the pump into its housing. Using a power tool, Gerst then drove four bolts home to lock the pump in place. Wiseman secured insulation and stored a grapple fixture that had been attached to the pump module to complete the job. With that bit of unfinished business complete, Wilmore moved Gerst to the right side of the Destiny laboratory module to replace a light in a video camera assembly. The light is used to provide illumination when cargo ships approach the station in orbital darkness. The final major task for U.S. EVA-27 was to install equipment known as the mobile transporter relay assembly, or MTRA. The mobile transporter moves along rails on the front face of the solar power truss to position the robot arm at various worksites. It is equipped with a payload grapple fixture where components can be temporarily held in place and powered by the station's electrical system. The pump module was mounted on that fixture until its removal earlier Tuesday. The MTRA will allow flight controllers to route power to attached payloads even if a problem of some sort prevents the mobile transporter's payload attachment fitting from drawing power from a given worksite. Installing the MTRA and its cabling took most of the time left in the crew's spacewalk timeline. But there were no problems of any significance and after briefly considering two additional "get-ahead" tasks, flight controllers told Wiseman and Gerst to pack up their tools and call it a day. "Really, really nice work today, just a great job," astronaut Douglas Wheelock radioed from mission control in Houston. "Thanks, Wheels," Wiseman replied. "Alex and I would just like to express our huge gratitude for getting us back into planned EVAs, safely outside, safely back in on a great EVA. It's a good day for NASA, it's definitely a good day for the European Space Agency." Added Gerst: "We want to say thanks to all the training teams, both at NASA and at ESA for all the hard work ... that got us to this point." If all goes well, Wiseman and Wilmore will venture outside the station next Wednesday, Oct. 15, to replace an electrical component in the lab's solar power system that failed earlier this year, knocking out one of the space station's power channels. The lab complex is equipped with eight large NASA-supplied solar panels that provide power to eight distribution channels. Each array is equipped with a device called a sequential shunt unit, or SSU, that regulates voltage. The SSU in power channel 3A failed last May, forcing flight controllers to divert power from another channel to a variety of components. Wiseman and Wilmore plan to remove and replace the faulty SSU during a night pass when the arrays are not generating power. Once that work is complete, the astronauts will relocate a spacewalk foot restraint, repair a camera on the left-side of the solar power truss and move another television camera assembly from the top of the port-1 truss segment to the upper side of the forward Harmony module. Two Russian cosmonauts -- station commander Maxim Suraev and Alexander Samokutyaev -- plan a spacewalk of their own on Oct. 22 to swap out external experiments and carry out routine maintenance. With the completion of Tuesday's spacewalk by Wiseman and Gerst, station EVA time logged by 118 astronauts and cosmonauts representing nine nations now stands at 1,142 hours and 15 minutes, or 47.6 days.